This minnie trike is suitable for children from 12 months as a parent controlled trike and from 2-3 years as a child controlled trike. For safety this trike comes with surround bars and a seat with adjustable harness. This trike features a removable parent steering handle with footrests for your childs feet. 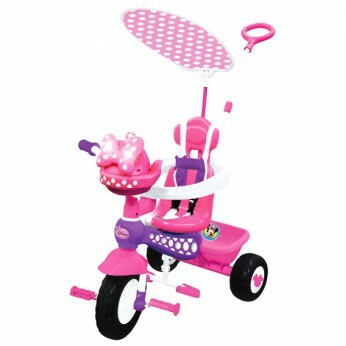 This Minnie trike also includes a sun canopy and a rear bucket for handy storage. This toy costs approximately £79.99 (for the latest and best prices make sure you check our retailer list for the Minnie Mouse Push n Ride Trike above). In our review of Minnie Mouse Push n Ride Trike we classed it as being suitable for ages 1 to 3 years, 3 years but recommend you check the manufacturer specific advice before purchasing.